Elevators, overflowing porta potties, drive-thru ATM machines -- these are just a few of the many places where you likely wouldn't enjoy getting trapped overnight. A Wisconsin man, however, recently found what's perhaps the ideal place to be stranded for multiple hours late at night: a convenience store's beer cooler. The man, who police identified as 38-year-old Jeremy Van Ert, made the most of the bizarre experience after he was automatically locked inside the refrigerated storage space at a Kwik Trip store in Marshfield, Wisconsin at midnight on Tuesday. 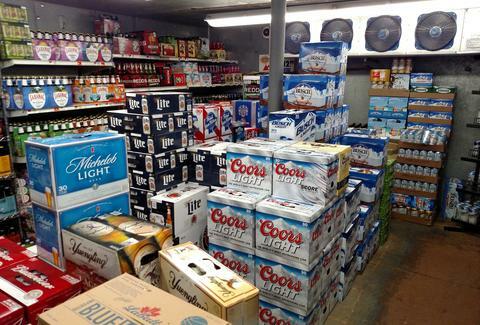 As a report by the Associated Press explains, he helped himself to an 18oz bottle of beer and three malt beverages before a customer noticed him in the cooler at around 6am on Wednesday. He reportedly fled the store without paying for the drinks when employees let him out. While the sudsy sleepover of sorts sounds like the happiest of accidents, authorities in the central Wisconsin town accuse Van Ert of intentionally trapping himself in the cooler because he knew employees at the convenience store wouldn't serve him, according to a report by local news station WAOW 9. Police later arrested him and charged him with retail theft, saying he could have knocked on the cooler's glass door to get the store employees' attention. "The subject found himself locked in the beer cooler, knew that Kwik Trip would not sell him any beer, so he decided to remain in the beer cooler," said Marshfield Police Chief Rick Gramza, per the report. "This is unique, I've been here twenty years. I've heard of people being locked inside of buildings, never inside of a beer cooler." Thankfully, there are plenty of ways to enjoy unfettered access to beer -- without shivering in a giant cooler and, you know, getting arrested -- including a recent opportunity to become a brewery's "professional beer taster." Tony Merevick is Senior News Editor at Thrillist and can't decide if he would enjoy this or freak the hell out. Send news tips to news@thrillist.com and follow him on Twitter @tonymerevick.